I hope you had a sunny first weekend of August! It was rainy and gloomy here in Jersey, so not much fun in the sun was to be had. I started a new book, This Dark Road To Mercy, which is very good so far, and did tons of cooking (what’s new there!). Another accomplishment, I picked out a durable, high quality backpack to hopefully get me though college in the city. We’ll see 😉 Besides that, nothing much else happened. So instead, let’s get into something deep today. Saturday was a lazy morning of chocolate pumpkin pancakes, blogging, homework, grocery shopping, cooking! (there is going to me a special never before Saturday post form me this week because it will be Recipe Redux Day! ), yoga, and not much else. Except I stayed up an extra hour-ish until almost 10! to read. Then when I bent down to turn on my fan and turn off the light, I smashed my head on the corner of my dresser. It hurt so bad, but I didn’t want to freeze myself and put ice on it. (I know that is really bad) So I just sucked it up and went to bed. Now I can’t tough that side of my head and I have a small bump…. (hopefully no concussion, haha!). Sunday was the same, plus a little organization and cleaning. I also did a little more research into yoga teacher training. I really want this to happen, it would complete transform my life 🙂 I have been reading about and reaching out to some different bloggers about their experiences and everyone is telling me to go for it and not one has ever regretted it. Big 2014 goal, I have my sights on you! (P.S. If you did your yoga training in NJ and know of a great studio, please contact me @ strengthandsunshine@gmail.com). 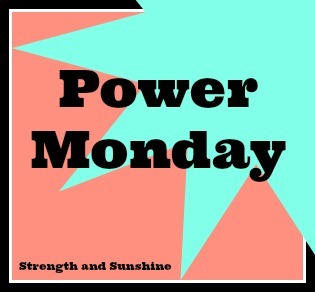 So Power Monday is here again! And so is the Winter (officially on the 21…go figure!). With the Winter comes the need for warmth and to stay indoors as much as possible. Especially those dark terrible evenings. But with that comes sickness. Being in a school environment I see and encounter so many sick children and teachers everyday. It really is gross (I can’t stand when people cough. If they do I want to jump out of my seat and run away. i just can’t handle it. I guess that is why my once dream of being a doctor totally went down the drain!) But being cooped up and indoors just breeds germs, especially when most people do not take the proper precautions and even knowingly spread their germs by coming to school/work while sick, not washing their hands, and not covering their sneezes and coughs, ugh! 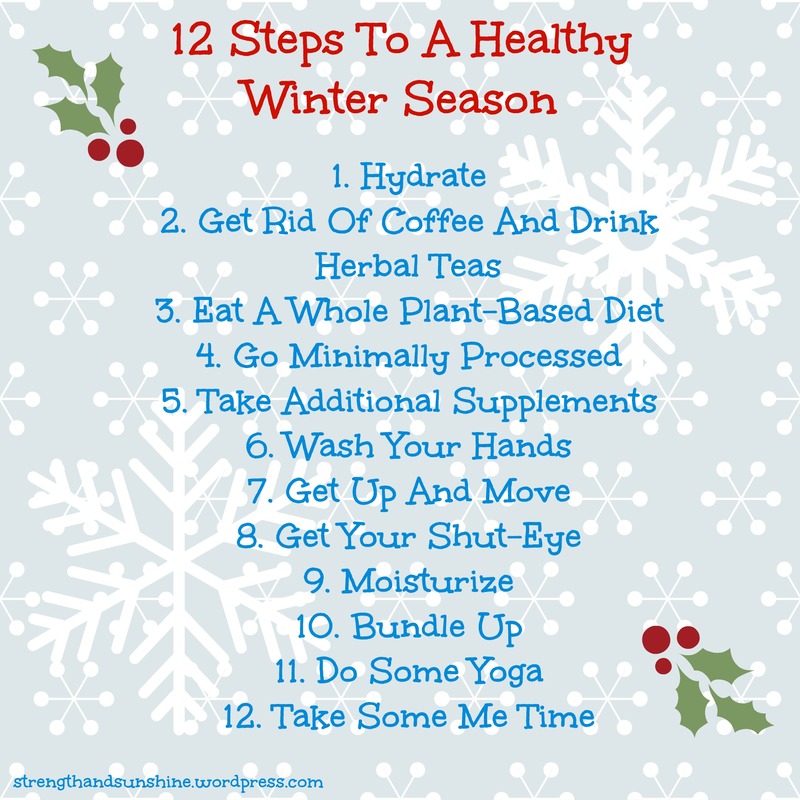 So to combat this potentially treacherous time for your health, here are my top 12 tips for staying at optimal wellness! 1. Hydrate: Well we all know the benefits of water. It is pertinent to get in your liquids in the winter. It is essential for your immune system and health for flushing out those toxins and germs. 2. Get Rid of Coffee and Drink Herbal Teas: Teas are chock-full of antioxidants and a great way to stay nice and toasty. Try not to rely on you caffeine habit and brew up so peppermint, roobios, dandelion root, green, and chamomile teas! 4. Go Minimally Processed: The worst things you could eat are those processed bleached white flour cookies and non-fat sugar filled yogurt. They are devoid of nutrients and full of sugar and empty calories. If you want your sweets, consider baking them yourself. You can thus choose healthy ingredients that will benefit your body and you come out with a recipe that I can guarantee will be more satisfying to the taste buds and the body than those processed counterparts! 5. Take Additional Supplements: The first step to getting those vitamins you need is by eating that whole plant-based diet. But sometimes a little extra is best. You may think Vitamin C is best, but Vitamin C only shortens the duration of illness, it is not the cure-all. So yes you may want to take additional Vitamin C, but Vitamin D is also essential. You won;t be getting it naturally from the sun so stock up on those. Also consider zinc, magnesium, and echinacea. These will keep your immunity and body at top notch levels. 7. Get Up and Move: Exercise is so important! Even if it is just 30 minutes a day, get up and move your body. Try not to sit for more than 30 minutes at a time. Get that blood flowing and that immune system pumping. Not only will you feel better, but you will give yourself a boost of energy and life! 8. Get Your Shut-Eye: If you follow #7 than this should be a little easier. Exercise helps with sleep and so does that plant-based diet. Don’t stay up all hours of the night and keep a consistent sleep schedule. Go to bed the same time and wake-up the same time, even on weekends. Turn off the technology, grab some tea, read a book, and relax in bed if you are having trouble. Sleep in total darkness as well and even try having a fan going. I need the white noise to sleep and have my whole life. It may be just the thing for you too. Anyway you can get those precious hours of sleep, do it! When you sleep your body heals and restores and that is what you need to fight off illness. 9. Moisturize: Your skin is the first line of defense against those germs and during the winter all forces are working against you. Your skin is going to dry out, crack, split, and let in those invaders if you don’t moisturize daily. My go-to moisturizers are Neutrogena’s Hand Cream and baby oil. Another great option is coconut oil. Completely natural and you will smell lovely! O and if you are outside, say skiing, remember to rub on that sun-screen. Even in the Winter you can get a nasty burn! 10. Bundle Up: Wrap the neck with a scarf (I wear one everyday and feel totally naked without it! ), zip that coat all the way up to protect the chest. Wear gloves to keep those hands from drying out. Find a perfect coat, hat, and boots (plus some warm fuzzy sock for underneath. Don’t let your body freeze. Keep your internal temperature consistent and you won’t give those germs and bacteria a optimal entry time. 11. Do Some Yoga: This goes along with getting up and moving everyday. But yoga is perfect for the body, mind, and spirit. Not only will you get a great workout, but you can relax the mind, wind down, and de-stress. You can also do some yoga breathing and meditation to help with de-stressing. When you are stressed you immune system and body are compromised. So roll out your mat and do some flow! Have any additional stay-healthy-tips to share? When you find some me time, what do you enjoy doing? I like to read an actual novel and be away from technology but I am finding that harder and harder as I get more sucked into the blog world and social media.